Travis Martin of Wilbur Cross won the boys 1600 in 4 minutes, 19.79 seconds, Christopher Pigatt of Hamden won the 55 dash in 6.50 and Rodney JR Davis of Hamden won the 300 in 36.22. Caleb Owen of Wilbur Cross was second in the 300 in 36.41 and Pigatt was third in 36.44. Among the top FCIAC standouts were Malcolm Going of Danbury who won the 600 in 1:24.01 and Chet Ellis of Staples who won the high jump in a meet record 6 feet, 9 inches (tied school record). High jump standout Justin Forde of McMahon did not compete in the event due to a sprained ankle according to Staples coach Laddie Lawrence. Hall won the boys team title with 60 points, Norwich Free Academy was second with 59 and Glastonbury was third with 52.66. Lauren Moore led Danbury to the girls team title with a win in the 1600 (5:12.18). But it was the next to last event (3200) that clinched the win where the Hatters finished second, third and fourth. Danbury won with 74 points and Glastonbury was second with 73. “This close finish is what I expected,” Danbury girls coach nick Fraticelli said. “There are unbelievable teams in LL and the coaches come here well prepared. Everyone contributed tonight. For Martin, he couldn’t have been happier with his win in the 1600. “I was really nervous going into the race because there were so many talented guys I was afraid of,” Martin said. “But I knew going into the race if I held up well most of the race and was in position to use my kick, I’d be okay. To win this is a great feeling. Going said he wanted to conserve his energy and did just enough to win the 600. Pigatt said a solid start was the key for his win in the 55. In the girls meet Tess Stapleton of Fairfield Ludlowe had a meet to remember winning the 55 hurdles in a meet record 8.25 and winning the long jump in 18-0.25. “What I did today isn’t what I expected to do, but it was what I hoped I would do,” said Stapleton, who was also tied for second in the high jump (5-2). “I am very happy right now, to do so well in all three events. This performance today has me really excited for the State Open (Saturday, noon, Floyd Little Athletic Center). It’s take a lot of hard work and dedication to the sport year round for me to get to this successful level. Moore’s game plan was to just run as hard as she could in the 1600. Allyson Lewis of Norwich Free Academy won the high jump by clearing a meet record 5-6. 55 Meter Dash Finals: 1. Christopher Pigatt, Hamden, 6.50; 2. Joel Stewart, Enfield, 6.57; 3. Korey Morton, Brien McMahon, 6.58; 4. Michael Rodia, Shelton, 6.60; 5. Aaron White, East Hartford, 6.67; 6. Malik Thomas, Danbury, 6.70. 300 Meter Dash: 1. Rodney JR Davis, Hamden, 36.22; 2. Caleb Owen, Wilbur Cross, 36.41; 3. Christopher Pigatt, Hamden, 36.44; 4. Nazaiah Paul, Norwich Free Academy, 37.24; 5. Andrew Rison, Glastonbury, 37.38; 6. Malik Thomas, Danbury, 37.69. 600 Meter Run: 1. Malcolm Going, Danbury, 1:24.01; 2. Simon Jupp, Ridgefield, 1:24.61; 3. Ryan Slesinski, Southington, 1:25.51; 4. Muhammad Ali, Hall, 1:26.24; 5. Nassaiah Betancourt, Wilbur Cross, 1:26.30; 6. Ryan Smith, Glastonbury, 1:26.53. 1000 Meter Run: 1. Miller Anderson, Hall, 2:36.84; 2. Mahammed Hussain, Wilbur Cross, 2:37.51; 3. Samuel Wilcox, Glastonbury, 2:37.60; 4. Henry Haas, Staples, 2:37.85; 5. Dylan Rendon, Hall, 2:39.50; 6. Andrew Suhie, Manchester, 2:39.61. 1600 Meter Run: 1. Travis Martin, Wilbur Cross, 4:19.79; 2. Trey Cormier, Hall, 4:22.20; 3. Edward Tristine, Fairfield Prep, 4:24.30; 4. Robert Dillon, Shelton, 4:26.78; 5. Jacob Smith, Glastonbury, 4:26.91; 6. Azaan Dawson, Fairfield Prep, 4:27.15. 3200 Meter Run: 1. Jacob Hefele, Danbury, 9:21.83; 2. Trey Cormier, Hall, 9:24.48; 3. Kedar Chavan, Fairfield Ludlowe, 9:25.53; 4. Aidan Puffer, Manchester, 9:26.19; 5. Travis Martin, Wilbur Cross, 9:32.60; 6. Morgan Fierro, Staples, 9:34.48. 55 Meter Hurdles: 1. Osaretin Osagie, Norwich Free Academy, 7.89; 2. Jonathan Lindsay, New Britain, 7.91; 3. Chaz Williams, New Britain, 8.00; 4. Sandre Taylor, East Hartford, 8.17; 5. Alexander Beiku, Danbury, J8.17; 6. Devin Wasilefsky, Glastonbury, 8.25. 4×200 Meter Relay: 1. Greenwich (Lance Large, Christopher Wint, Hunter Clark, Zane Robinson-Nye), 1:33.39; 2. Hamden (Christopher Pigatt, Rodney JR Davis, Jose Sanchez, Christopher Wallace), 1:33.65; 3. Hall (Joseph Morin, Yovan Rivera, Isaiah Lizardi, Jordaine Wisdom), 1:33.76; 4. Shelton (Jason Lorent, Michael Rodia, Martin Kovachev, Camerin Gumbs), 1:34.63; 5. Danbury (Malik Thomas, Jaden Cazorla, Luka Santos, Shamar Carter), 1:34.96; 6. Glastonbury (Alec Hughes, Andrew Rison, Devin Wasilefsky, Oluwatobi Bakre), 1:35.25. 4×400 Meter Relay: 1. Hall (Joseph Morin, Tobias Ruffo, Muhammad Ali, Miller Anderson), 3:31.34; 2. Danbury (Jaden Cazorla, Gabriel Kwarteng, Alexander Beiku, Malcolm Going), 3:33.00; 3. Southington (Trevor Porter, John Carreiro, Joseph Verderame, Ryan Slesinski), 3:33.27; 4. Glastonbury (Samuel Wilcox, Ryan Smith, Devin Wasilefsky, Andrew Rison), 3:35.14; 5. Greenwich (Anthony Hill, Lance Large, Akash Molekudy, Zane Robinson-Nye), 3:35.80; 6. Wilbur Cross (Elliot Faulkner, Mahammed Hussain, Nassaiah Betancourt, Caleb Owen), 3:36.61. 4×800 Meter Relay: 1. Glastonbury (Samuel Wilcox, Jadyn Nogueira, Ryan Smith, Matthew Cosentino), 8:10.57; 2. Staples (Andrew Zuckerman, George Lepska, Nicholas Taubenheim, Morgan Fierro), 8:11.60; 3. Wilbur Cross (Eamon Hill, Nassaiah Betancourt, Noah Lee, Elliot Faulkner), 8:11.65; 4. Hall (Muhammad Ali, Jackson Grady, Joshua Fernandes, Austin Blodgett), 8:12.06; 5. Fairfield Ludlowe (Kedar Chavan, Nico Rullo, Ethan Lovallo, Colin Agostisi), 8:13.77; 6. Danbury (Gabriel Kwarteng, Ryan Caldwell, Brennan Amalfitano, Jack Watson), 8:17.81. 1600 Sprint Medley: 1. Danbury (Luka Santos, Jaden Cazorla, Gabriel Kwarteng, Malcolm Going), 3:38.06; 2. Hall (Joseph Morin, Yovan Rivera, Isaiah Lizardi, Miller Anderson), 3:42.95; 3. Southington (Trevor Porter, John Carreiro, Joseph Verderame, Ryan Slesinski), 3:44.58; 4. Wilbur Cross (Devin Cue, Jasiah Barnes, Jeremiah Williams, Mahammed Hussain), 3:47.29; 5. Staples (Aiden Rose, Adam Bullock, George Lepska, Henry Haas), 3:49.74; 6. Norwalk (Tahzir Fulton, Kyle Gordon, Malique Stevens, Frank Bonaddio), 3:49.88. High Jump: 1. Chet Ellis, Staples, 6-09#; 2. Jahiem Spruill, Norwich Free Academy, 6-02; 3. Dillon Buongiorno, Fairfield Ludlowe, 5-10; 4. Marquel Caesar, Wilbur Cross, 5-08; 4. Justin Costick, Norwich Free Academy, 5-08; 6. Owen Bianchi, Greenwich, J5-08. Pole Vault: 1. Jacob Bazinet, Norwich Free Academy, 13-06; 2. Jake Lavalette, Glastonbury, J13-06; 3. Casey Selinske, Southington, 12-06; 4. Aiden Jasinski, Newtown, 12-00; 4. Tanner Badey, Glastonbury, 12-00; 4. Jack Sevigny, Glastonbury, 12-00. Long Jump: 1. Jahiem Spruill, Norwich Free Academy, 21-08.25; 2. Jack Sevigny, Glastonbury, 20-03.50; 3. John Orefice, Fairfield Ludlowe, 20-02.75; 4. Carter Lambo, Fairfield Ludlowe, 20-00.50; 5. Robert McCulloch, Fairfield Prep, 19-11; 6. Troy Bardos, Brien McMahon, 19-08.50. Shot Put: 1. Nathan Quaye, Manchester, 53-10; 2. Cameron Belton, Norwich Free Academy, 53-04.50; 3. Adelino Daviega, Norwich Free Academy, 52-03.50; 4. Nana Yaw Agyeman, Glastonbury, 49-00; 5. Eric Tann, Manchester, 46-09; 6. Nicholas Gianni, Glastonbury, 45-01.25. 55 Meter Dash Finals: 1. Kate Shaffer, Conard, 7.24; 2. Maya Mocarski, Fairfield Ludlowe, 7.33; 3. Selina Soule, Glastonbury, 7.36; 4. Shanell Stewart, Danbury, 7.53; 5. Abbygail Michel, Trumbull, 7.54; 6. Tiatianna Jones, Hamden, 7.59. 300 Meter Dash: 1. Samantha Forrest, Glastonbury, 41.42; 2. Savannah Bromley, Brien McMahon, 42.67; 3. Nichele Smith, East Hartford, 42.69; 4. Alysia Joseph, Hamden, 43.13; 5. Jordan Numme, Greenwich, 43.53; 6. Carrina Dabroi, Ridgefield, 43.93. 600 Meter Run: 1. Kamilah Diaz, East Hartford, 1:38.73; 2. Emily Alexandru, Trumbull, 1:38.99; 3. Molly Harding, Glastonbury, 1:39.57; 4. Love’ Melton, Hamden, 1:39.77; 5. Ally McCarthy, Newtown, 1:40.49; 6. Laura Turner, Norwalk, 1:43.35. 1000 Meter Run: 1. Kate Hedlund, Manchester, 3:04.42; 2. Daniella Grullon-Pena, Danbury, 3:09.94; 3. Kate Kemnitz, Southington, 3:10.29; 4. Grace Sparrow, Glastonbury, 3:11.28; 5. Kayla Park, Norwich Free Academy, 3:11.35; 6. Julia Potter, Amity, 3:11.53. 1600 Meter Run: 1. Lauren Moore, Danbury, 5:12.18; 2. Zoe Harris, Greenwich, 5:15.49; 3. Stephanie Queiroz, Danbury, 5:15.54; 4. Tess Pisanelli, Ridgefield, 5:16.05; 5. Gabriella Viggiano, Ridgefield, 5:19.16; 6. Sophia LaFalce, Fairfield Ludlowe, 5:23.39. 3200 Meter Run: 1. Mari Noble, Greenwich, 11:06.55; 2. Daniella Grullon-Pena, Danbury, 11:19.60; 3. Lauren Moore, Danbury, 11:19.77; 4. Stephanie Queiroz, Danbury, 11:23.13; 5. Caroline Webb, Greenwich, 11:23.58; 6. Kate Hedlund, Manchester, 11:23.81. 55 Meter Hurdles: 1. Tess Stapleton, Fairfield Ludlowe, 8.25#; 2. Kasidy Quiles, Shelton, 8.80; 3. Jaylyn Carter, Danbury, 9.04; 4. Audrey Benson, Newtown, 9.26; 5. Jazlynn Touissaint, Norwich Free Academy, 9.32; 6. Elizabeth DeMassa, Ridgefield, 9.60. 4×200 Meter Relay: 1. 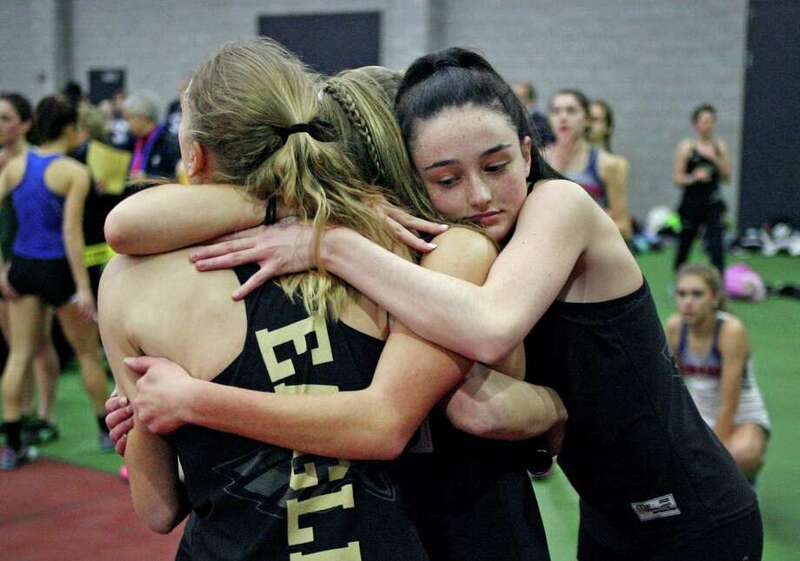 Glastonbury (Selina Soule, Molly Harding, Maya Bridgeford, Samantha Forrest), 1:45.43; 2. Brien McMahon (Niamh Linehan, Savannah Bromley, Chloe Ortolano, Peyton McNamara), 1:48.50; 3. Danbury (Shanell Stewart, Meilee Kry, Briana Gilliard, Jessica Glowacki), 1:48.64; 4. East Hartford (Nichele Smith, Yarisha Oliveras, Janaiya Cruz-Bermudez, Kamilah Diaz), 1:49.29; 5. Greenwich (Jada Williams, Katherine Large, Abril Martinez-Arraya, Jordan Numme), 1:49.32; 6. Ridgefield (Catherine Conroy, Carrina Dabroi, Carolyn Donovan, Natasha Riek), 1:49.84. 4×400 Meter Relay: 1. Glastonbury (Molly Harding, Maya Bridgeford, Grace Sparrow, Samantha Forrest), 4:02.28#; 2. Greenwich (Cameron Castelli, Jordan Numme, Demarest Janis, Zoe Harris), 4:09.58; 3. Ridgefield (Natasha Riek, Emma Langis, Carolyn Donovan, Grace Michalowski), 4:09.97; 4. Hamden (Alysia Joseph, Arreiyona Jones, Ehsan ibet, Love’ Melton), 4:10.75; 5. Danbury (Meilee Kry, Alex Chakar, Cassandra Sturdevant, Jessica Glowacki), 4:13.90; 6. Brien McMahon (Niamh Linehan, Peyton McNamara, Jocelyn Lister, Cassidy Nash), 4:16.52. 4×800 Meter Relay: 1. Ridgefield (Tess Pisanelli, Rory McGrath, Gabriella Viggiano, Grace Michalowski), 9:35.52; 2. Trumbull (Kali Holden, Carolyn Cardell, Alessandra Zaffina, Emily Alexandru), 9:41.10; 3. Glastonbury (Angela Braga, Casey MacElhiney, Joelle Solecki, Grace Sparrow), 9:41.27; 4. Danbury (Maya Gawley, Valerie Fox, Alex Chakar, Caroline Williams), 9:57.35; 5. Norwich Free Academy (Emma Ricketts, Catherine Shannon, Genevieve Buckridge, Kayla Park), 9:59.59; 6. Hall (Mia Healer, Francesca Lynch, Emily Cubbage, Rose Kitz), 9:59.63. 1600 Sprint Medley: 1. Ridgefield (Catherine Conroy, Emma Langis, Carolyn Donovan, Grace Michalowski), 4:20.02; 2. Hall (Lexi Nieves, Jessica Mason, Mia Healer, Rose Kitz), 4:22.71; 3. Glastonbury (Alison Guy, Emma Smith, Maya Bridgeford, Angela Braga), 4:26.53; 4. Conard (Kate Shaffer, Allison Schneider, Molly Binder, Liana Eisler), 4:26.85; 5. Manchester (Hannah Sullivan, Jonaye Williams, Brianna Sechrest, Zariah Chiverton), 4:27.35; 6. Brien McMahon (Kailynn Ortiz, Jessica Trujillo, Cassidy Nash, Riley Stenger), 4:27.93. High Jump: 1. Allyson Lewis, Norwich Free Academy, 5-06#; 2. Sydney Garrison, Southington, 5-02; 2. Tess Stapleton, Fairfield Ludlowe, 5-02; 2. Savannah Bromley, Brien McMahon, 5-02; 5. Taryn Smith, Hall, 5-00; 6. Allison Schneider, Conard, 4-10. Pole Vault: 1. Paige Martin, Norwich Free Academy, 11-03; 2. Madison Martin, Norwich Free Academy, 10-06; 3. Mallory Malz, Glastonbury, 10-00; 3. Katie Ryan, Newtown, 10-00; 5. Claire Ittleson, Conard, 9-06; 6. Laurel Blackman, Fairfield Ludlowe, 9-00. Long Jump: 1. Tess Stapleton, Fairfield Ludlowe, 18-00.25; 2. Selina Soule, Glastonbury, 18-00; 3. Meilee Kry, Danbury, 17-09.50; 4. Giuliana Robles, Danbury, 17-02.75; 5. Lixing Counsilman, Glastonbury, 17-01.50; 6. Peyton McNamara, Brien McMahon, 16-08. Shot Put: 1. Trinity Cardillo, Southington, 39-06.50; 2. Katherine George, Hall, 36-07.25; 3. Yasmeen Dabiran, Shelton, 35-02.25; 4. Mira Mohler, Hall, 33-10.25; 5. Dinaka Onoh, Hall, 33-04.75; 6. Sarah Ovesny, Shelton, 33-02.25.